Now you will never have to worry about scratching your LPs again. You will also be able to play your LP music in your car or any other CD player that can play recordable CDs! To record a vinyl LP to convert to a CD or MP3 Files you need to use a 'WAV file recorder' to store a WAV format file on your hard disk. Most general purpose WAV recorders are packed with functions. They tend to be complicated and time-consuming to configure and use. LP Recorder has been designed with one purpose in mind - to record vinyl LPs. Connect the tape or line output from your stereo to the line input of your soundcard, select the recording input, enter a filename and press the record button. You can also record audio from your cassettes, tapes, CDs, DVDs, VCRs, TV, radio, MiniDisc etc. - or any other audio source that you can connect to your soundcard's line-in input. LP Recorder is designed to be used with the track splitting program LP Ripper and the CD-burning software LP Burner. However, LP Recorder can be used with most other software capable of processing audio CD-quality 16-bit stereo WAV files. 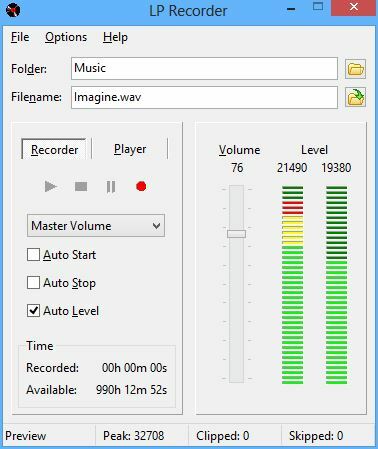 Alternatively select Encode Tracks from the LP Ripper menu to save the tracks as compressed MP3 files compatible with the Apple iPod or similar portable MP3 player. Download the trial copy of LP Recorder. It includes all features of the registered full version for you to use for an unlimited time except that each recording is limited to approximately 4 minutes.